Get ready to jump into the rabbit hole when Heart Castle lands on Android devices today! Heart Castle is a 3D role-playing mobile game based on the story of Alice in Wonderland, where you explore the kingdom to battle, capture, and collect hundreds of unique Monsters to join you in your adventures. You can enhance your monsters, enter fun yet challenging game modes, and build your collection of Monsters in your search for Alice, all rendered in cute and colorful 3D. 1. Like and share the Playpark Heart Castle PH fan page<https://www.facebook.com/HeartCastlePH?ref=ts&fref=ts>. Heart Castle Beta is from March 24, 2015 to March 30, 2015. Published by Asiasoft’s PlayPark, Heart Castle is now available for Android devices, with iOS not far behind. For the latest news about Heart Castle, follow the official Heart Castle Facebook Page<https://www.facebook.com/HeartCastlePH?ref=ts&fref=ts>. Get10 Free Rubies Daily!! Claim yours NOW!! 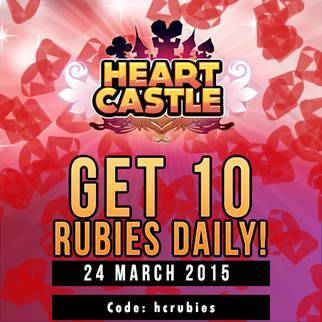 2) Select redemption and choose “10 Daily Rubies (24 March)”. March 24, 2015 until March 30, 2015 ONLY!!! So don’t miss the free RUBIES! Formerly known as Playweb Games, Inc., PlayPark, Inc. is the publisher and operator of Level Up! (www.levelupgames.ph<http://www.levelupgames.ph/main>) and PlayPark (www.playpark.com<http://www.playpark.com/>) in the Philippines. With a vast portfolio of hugely popular Massively Mutliplayer Online Games, which includes RAN Online, Strife, DC Universe Online, Phantasy Star Online 2, and Ragnarok Online – the game that started the online gaming craze in 2003, PlayPark Inc. is the leading game publisher in the online gaming industry in the country today. DON’T MISS: Metal Gear Solid Seiyuu: "Kojima was fired"